It seems like just yesterday that the 2015-2016 season was getting underway with the first UCI races and the opening round of the World Cup in the US at Cross Vegas. And yet here we are, near the season’s end and the 2016 UCI Cyclocross World Championships in Heusden-Zolder, Belgium, being held this weekend. We’re going to take a preview look at each day of racing at the 2016 UCI Cyclocross World Championships in Zolder, starting with Saturday’s scheduled races to give you a glimpse of what you might expect when the start light turns green. 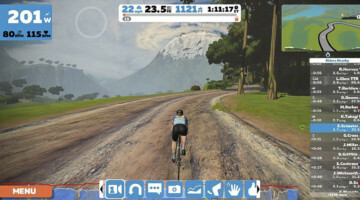 You can also get a preview look at the course thanks to Helen Wyman and Stages Cycling, here. When we think about Worlds, we have the benefit of having seen most of the international field race the Zolder course last month as part of the World Cup. While that race was a mostly dry affair, this weekend thus far looks like it could be a wet one on the sandy course in Belgium. Still, the fifth round of the World Cup in Zolder can give us some insight into what we might see this weekend at Worlds. There are three races on tap for the opening day, the Junior Men’s race at 9:50 GMT, the U23 Women’s (Women’s Youth) competition at 11:50 GMT, which is new for this year’s Worlds, and the Elite Women’s event, which wraps up the day at 1:50 pm GMT. 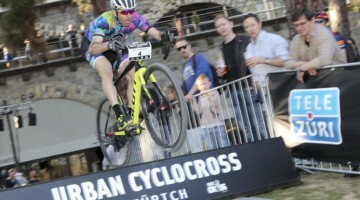 You can keep up with everything related to the 2016 Cyclocross World Championships here. This is one of the two or three races over the course of the weekend where Team USA really has a chance to make a mark. Gage Hecht will line up Saturday knowing he was a slight mechanical away from the podium last year, having finished fourth by mere seconds. He will surely be looking to get his revenge on Saturday. Hecht and Spencer Petrov rode well in Heusden-Zolder last month, with Hecht taking fifth and Petrov finishing 11th. Both riders also had strong showings in other World Cup events this year, including Petrov’s fourth at the World Cup in Namur. When you look at all of that, and factor in that Hecht has returned to Europe as a repeat National Champion, they each have to have confidence going into Worlds. Hecht, Petrov and the rest of the Junior Men for Team USA will face off against a bevy of Europe’s finest future stars. Dutch rider and European Champion Jens Dekker is ranked number one in UCI standings followed by Belgian Jappe Jaspers and none other than Hecht. 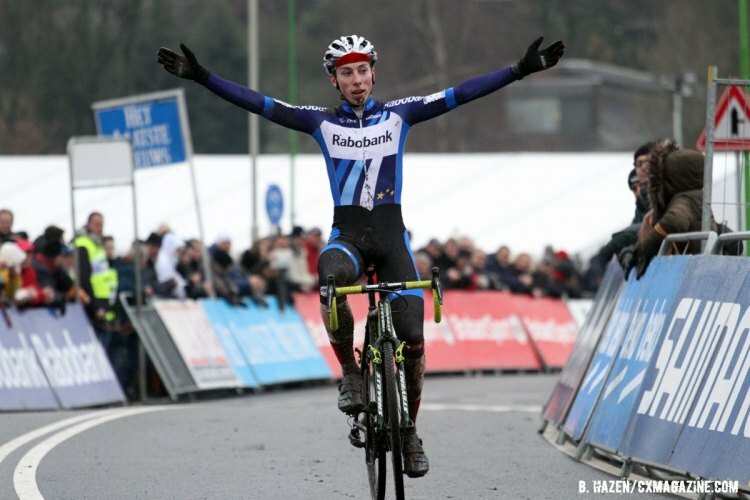 Jaspers finished second in Zolder in December and ended up taking the overall World Cup title…from Jappe Jaspers as the two were tied on points at the end of last week’s final World Cup in Hoogerheide. In the end, the final tally came down to placings at Hoogerheide, with that being the tie breaker. Bear in mind too that Dekker was leading in Zolder last month when he crashed out. Expect to see fireworks between those two riders with possibly France’s Tanguy Turgis and Hecht looking to make a move against them both. 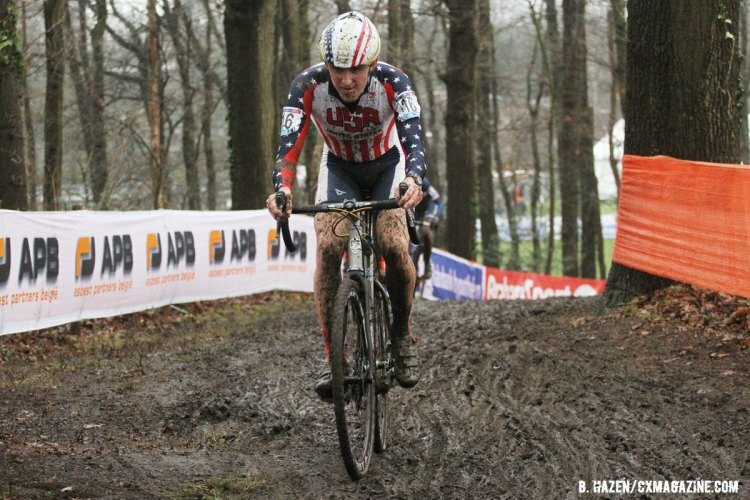 Team USA is fielding a strong team, despite some last minute drama with the roster, for this new category at the Cyclocross World Championships. Ellen Noble, the reigning U23 American National Champion, leads a powerful contingent of racers including Allison and Hannah Arensman. Hannah is the reigning National Junior Women’s 17-18 champion who, like Allison, was in the top 10 of the combined Women’s U23 field behind Noble. It appears that Noble or any other rider looking to be the first U23 Women’s Cyclocross World Champion will not have to beat the likes of Dutch National Champion Thalita de Jong as the 22 year old is on the start list for the Elite Women’s race. 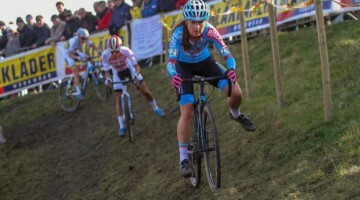 She was just off the podium in fourth in the Elite Women’s race at Zolder in December, and was second last weekend in Hoogerheide, which was a muddy affair. 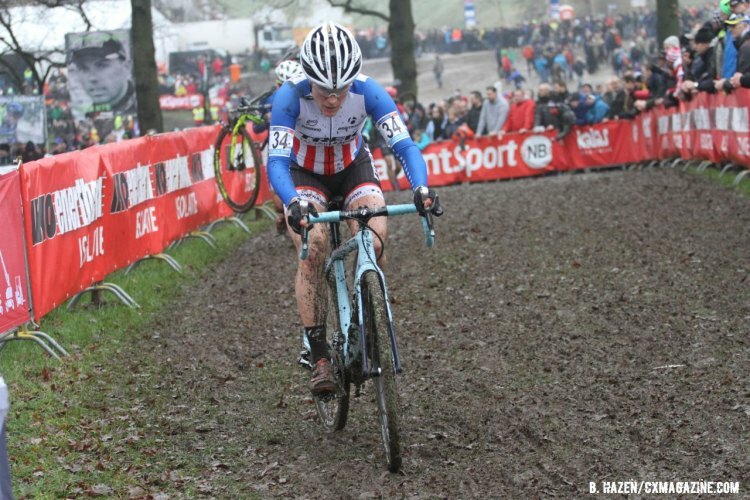 This weekend may be wet and sloppy, but less muddy than Hoogerheide, but either way, de Jong should be one to watch in the Elite Women’s race, the last race of the day. Still, the Women’s U23 field is marked by riders like Belgium’s Femke Van den Driessche the top UCI ranked U23 Woemn’s rider and the Netherland’s Maud van den Driessche ranked 15th in UCI points, both well ahead of Noble in 26th. From the start list and the results we’ve seen from these riders against the Elites, this race could be wide open giving one or more Team USA riders a real chance at making the podium. 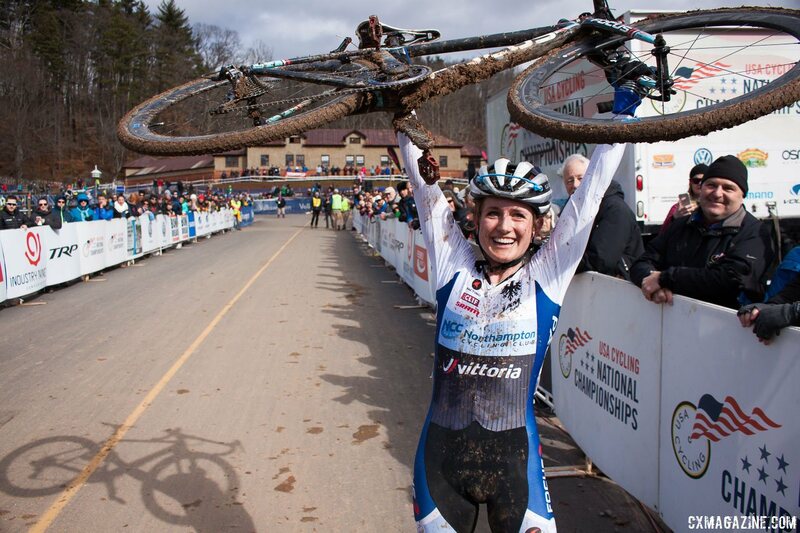 Sophia Gomez Villafane had an impressive ride in Asheville to finish second behind Noble, and could be a dark horse while flying the colors of Argentina. Belgium’s Cant is the World Cup leader and has stood on the World Championships podium twice, but never on the top step. The rainbow stripes could be the one thing missing from Cant’s palmares, and she seems determined to take it. 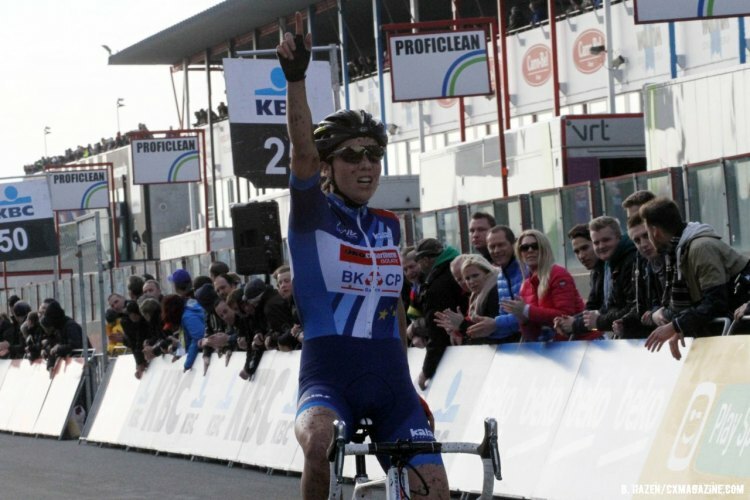 She also won in Zolder just a few weeks ago. But as far as the last World Cup race went for her though, she added, “I did everything I wanted to do, I trained really hard and I can’t do more than my best. I don’t know exactly what the problem was but it didn’t go very well. I had a lot of problems making speed in the heavy mud, but next week it’s a completely different course so I didn’t really work on this kind of course. I made a lot of mistakes but that can sometimes happen,” she said. 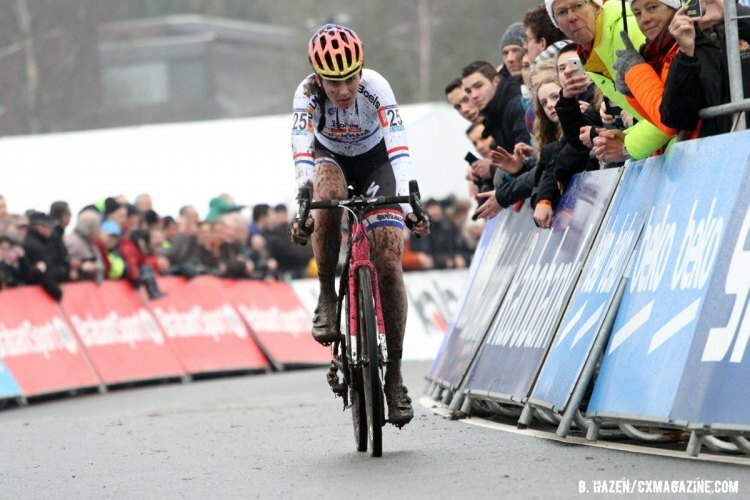 Would a muddy Zolder course do Cant in? 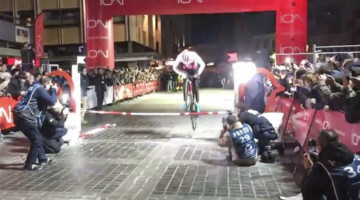 Cant’s main rivals are likely to be her compatriot Ellen van Loy, British National Champion Nikki Harris who took her title in muddy conditions, and Italian National Champion Eva Lechner. For her part, Van Loy feels that her form is just fine coming out of Hoogerheide. “I should be [in top form]! I’m happy. I worked very hard for the second half of the season to reach this level so I’m very happy,” she told the media. American chances of course rest on 12-time National Champion Katie Compton and a group of experienced racers including Kaitlin Anntoneau who was second at the World Cup in Valkenburg. But they, like everyone else on the start grid, will have to face off against Cant. Compton has had a number of near-misses and medals at Worlds, and with three of the top four from last year missing, the jersey could be hers for the taking on a good day, especially if Cant stumbles out of the blocks. Whatever happens in the Elite Women’s race, there will be a new World Champion. The defending champion Pauline Ferrand-Prévot of France is out as she missed this cyclocross season due to injury. We’ll see how each of these races plays out on Saturday. 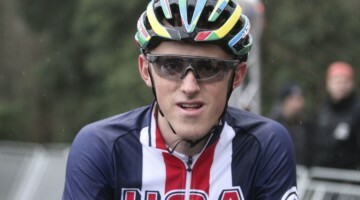 Stay tuned for our preview of Sunday’s racing, the U23 Men and the Elite Men. cyclocross I predict Sanne Cant but only bc FERRANDPREVOT will not be there. cyclocross such a hard call for all three. It will be exciting for sure. Cyclocross Magazine I might be wrong, but I could swear the UCI sked says U23 women are at 1300 GMT and your story says 11:50 GMT.